Colombia was one of the fastest-growing economies in Latin America over 2005-2014, resulting in rising disposable incomes and expansion of the middle class. By 2015, the number of middle-class households in the country had reached 3.2 million, or 24.2% of the total households. As in other developing markets, the growth of the middle class has led to changes in consumption patterns in the country. Reduced violence and increases in foreign direct investment led to further improvements in employment as well as real estate and infrastructure development. At 3.6kg per capita, Colombia’s retail tissue consumption still falls behind that of North America and Western Europe as well as more developed Latin American markets like Chile. Coupled with the improved economic and political situation, its low per capita rate was among the factors behind a positive trajectory in retail tissue sales across product categories over 2005-2014. In 2015, despite slowing economic performance, the demand for consumer tissue continued to see an overall positive trend in volume terms, although growth was more modest compared to the earlier years. In 2015, retail sales of consumer tissue grew by 2% in volume terms to reach 179,000 tonnes, which represented a slower pace of growth compared to the earlier years due to the weaker economy and price increases. Toilet paper continues to dominate retail tissue in the country, accounting for nearly 90% of overall consumer tissue sales. 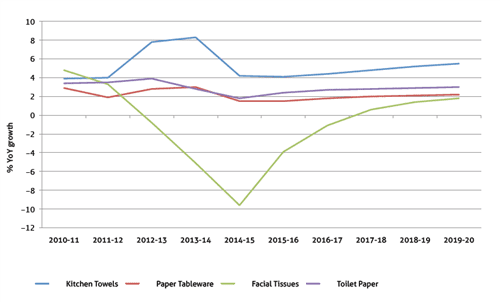 Demand for softer multi-ply toilet paper has been on the rise over the past several years, and the reduced prices and improved affordability of the higher-quality products helped to support demand among even lower-income groups. While the inflationary pressures of 2015 posed challenges, many Colombians were not willing to trade down from good-quality toilet paper. This trend is also being supported by the improved quality of tissue products in the value segment. Three-ply toilet paper – the most common format in Colombia – is now found across premium and value brands. The premium segment is represented by brands like Suave Gold, Familia Ultra Suave and Elite Premium as well as limited editions with softer and thicker tissue as well as coloured toilet paper and other value-added features. While slowing down significantly in 2015, kitchen towels still registered a healthy 4% increase in retail volume sales. The category has seen a significant evolution in terms of quality, featuring more absorbent and stronger tissue. Promotional and advertising efforts behind kitchen towels position the products as a good alternative to the more traditional trapo de cocina (kitchen cloth), which remains popular. To encourage the shift, manufacturers have been promoting more durable kitchen towels that can be used several times, thereby offering good value for money. In paper tableware, the tablecloths category remained negligible at the consumer level, with the usage mainly coming from the away-from-home channel. Paper napkins, on the other hand, saw a modest increase in retail volume. Higher-quality napkins, featuring designs, colours and thicker textures, are usually reserved for special occasions. Basic white napkins, on the other hand, are preferred for more regular use. To encourage more regular use of paper napkins, some brands developed small-sized products called “cafeteria type”, giving consumers a sense of economy and savings. At 0.2kg per capita in retail, compared to 0.6-0.7kg in the developed markets, the paper napkins category still offers room for growth. Economic slowdown, coupled with bulk purchases in the previous years on the back of significant promotional activity, resulted in consumer destocking and slower demand for facial tissue in retail in 2015. The category remains small, and per capita consumption falls considerably behind more developed markets, leaving room for growth across the economy and premium segments. In fact, even with economic slowdown and weaker consumer confidence, the category continued to see innovation in value-added products, such as Frescura Extrema by Productos Familia Sancela – the country’s leader in consumer tissue, owned by SCA. The new product range includes tissue with a menthol infusion to provide an extra sense of freshness. Colombia’s unmet potential in retail consumer tissue is estimated to be in excess of 140,000 tonnes, representing a good platform for further category development and growth. The inflationary outbreak and increase in prices in 2015 did not discourage the more affluent consumers from purchasing good-quality tissue products, a tendency expected to continue in the coming years. On a cautionary note, less financially secure consumers in the lower-income brackets will remain cautious, at least in the short term, especially when it comes to higher-priced tissue and products that are not seen as a necessity, such as kitchen towels, facial tissue and napkins. Nonetheless, the mid-to-long-term positive economic outlook for the country is also expected to manifest itself in a positive trajectory for retail tissue demand in the coming years, with a stronger uptake from 2018 onwards. Overall, retail sales of consumer tissue are expected to see a 3% CAGR in volume terms over 2015-2020, with positive demand across toilet paper, kitchen towels and paper napkins as well as gradual recovery in demand for facial tissue. As consumer demand will continue to evolve, innovation and product differentiation will become increasingly important in the changing and increasingly competitive marketplace. Additionally, balancing quality and price will remain important to encourage wider product adoption across all income groups. Share the post "Colombia: Middle class rise prompts growth even as economy slows"